Weight Watchers, Atkins, Cabbage Soup, Jenny Craig, South beach… those are just a few of the gazillion diets I’ve tried over the years. I don’t remember a time when I wasn’t dieting or trying to lose weight. And that’s going all the way back to 5th/6th grade! It likely won’t be different this time, and this is not your fault. Diets fail because they do not work sustainably over time. Your body is not a problem to be solved. It is your home and regarding it as separate, problematic, or disgusting can result in a type of detachment that interferes with your ability to hear its valuable messages to you. YOUR BODY IS NOT A PROBLEM TO BE SOLVED! OMG yes! Thank you Hilary & Dana from Be Nourished for saying this. Now, if only others would get behind this and believe it. 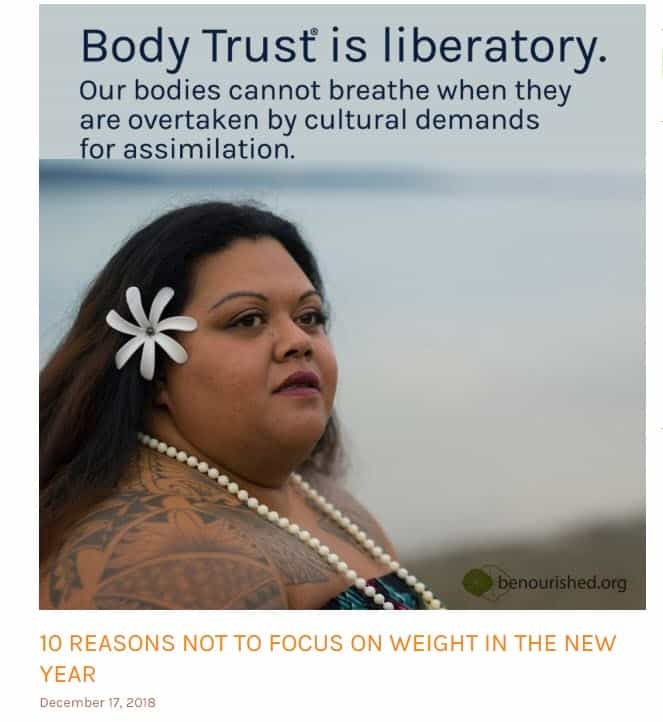 So, if dieting/losing weight is on your New Year’s Resolutions list, I encourage you to head on over and read 10 Reasons Not To Focus On Weight In The New Year now. You are so right Tishia! The diet industry wants us to fail so we keep coming back to try again. Diets don’t work! In a word… Awesome! Congratulations on discovering the freedom that comes from dumping dieting! Freedom was the first word that came to mind for me when I finally rejected dieting and diet mentality. It still feels like freedom, and it’s been at least 17+ years since I finished my very last diet (I had to end it, I was binging like crazy!). I’m excited for you and that you’re spreading the word!